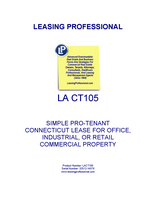 This form is for a single tenant Connecticut lease where the tenant has superior leverage. It gives the tenant the right to use the premises for "any legal use," and has very abbreviated remedies for the landlord in the event of a tenant default. It is also pro-tenant in character because of the clauses it does not contain which customarily appear in pro-landlord forms relating to remedies and a variety of other pro-landlord provisions. Connecticut is a highly productive agricultural state, leading New England in the production of pears, peaches and eggs. The state also produces weapons, sewing machines, jet engines and a slew of other hardware. Connecticut can also lay claim to producing the first telephone book, America’s first trade association and the first nuclear powered submarine. This incredible productivity is especially impressive since Connecticut is the forty-eighth largest state, surpassing only Rhode Island and Delaware in size.